I was out looking at new houses again recently (no surprise there). 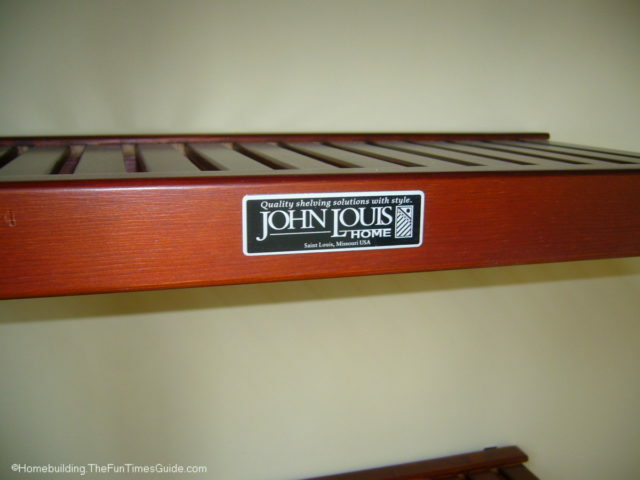 A solid wood closet organizer with a red mahogany stain. It’s a definite improvement over those ugly wire shelving systems! It’s a closet kit by John Louis Home. As it turns out, they have some really nice looking shelving and organizing systems. Their website states that it sells for $250, which includes delivery. It fits in a 10-foot space and provides up to 24 feet of shelf space. Anyway, you can read more about it at the link above. I decided to write about it because this type of wood closet shelving deserves more attention. It’s affordable and makes a huge difference in the look and feel of a closet — not to mention the added storage it provides for the homeowner. Now I have to admit that the system I show in the photos here is fairly bare bones, when compared to some of the custom shelving systems that are out there waiting to be installed (and installed in homes already). But my point is that wood is a big improvement over wire shelving — which should be limited to sheds, basements and garages, in my opinion. I wish wire shelving never existed and that solid wood (or slat wood) shelving systems were the norm used throughout the home building industry. Celebrity walk-in closets — take a look inside the closets of Eva Longoria, Nicky Hilton, Paula Abdul, Mariah Carey…and more! Walk-in wardrobe closets on Pinterest — too many to count. If you’re handy with a compound miter saw and want to save a little money, you might want to tackle this DIY closet project for fun… and a sense of pride. The main thing is to keep in mind what you will be using it for — so you can address any special specifications that you need to include in your closet organizing plan. The Family Handyman has a lot of how-to’s for DIY closet organizers. Bob Vila says these 5 DIY closet organizers are weekend projects. Ana White shows how she built a master closet system. 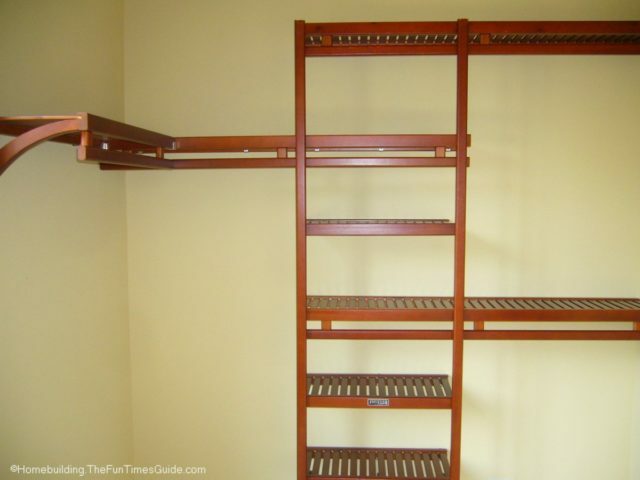 eHow shows you how to build wood closet shelves. Extreme How-To gives their very detailed DIY version of a installing wooden closet shelves. Here are a few great tips from DoItYourself on building custom made closet shelving. Ron Hazelton shows how to build your own child’s closet organizing system.